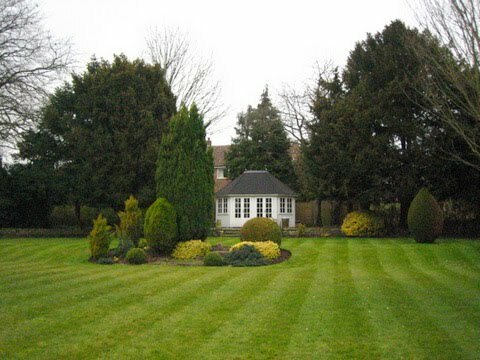 This garden is fully maintained by Eco Garden Maintenence including lawn mowing, lawn care, pruning, hedge cutting, weeding and everything else that is required to produce a garden of this standard. The standard rose is staked to prevent wind rock and fed every few months as roses are hungry plants that require a lot of nutrients to be healthy and flower. We designed the curved border and planted it using a variety of species to give colour and differing textures all year round. Notice the flowering Rosemary and Choisya in the foreground. The lawn has the classic striped effect produced by the Honda HRH536QX pro rotary roller mower. The edges of the lawn are trimmed every visit with the Pellenc battery powered strimmer used extensively by Eco Garden Maintenance. As the owner runs his business from home the low noise output from these battery powered tools are a very real advantage and result in no disruption to the habitants. As well as maintaining green spaces Eco Garden Maintenance look after numerous hard landscaped areas which are integral parts of the garden as a whole. This patio area is shaded to some degree and from time to time requires the intervention of a power washer. The trees in the background are situated as part of the property's boundary and as such provide important screening from adjacent homes. These trees are maintained so they never look hard pruned and always look natural. This garden border maintained by Eco Garden Maintenance has flowering plants of white only. All self seedlings that are known to be other colours have to be removed on a regular basis. The background is dominated by the rustic brick wall which has climbing roses and honeysuckle carefully trained along wires and ropes which droop between their supporting posts. A small Box and Hebe hedge can be seen at the front of the border. By early summer the roses will be awash with scented white flowers. A large garden maintained by Eco Garden Maintenance. The lawn has been mown with a Honda pro roller mower which produces long lasting stripes. The garden has a large amount of mature planting such as the Yew trees in this photograph. Much of the planting is of a coniferous or evergreen nature meaning the garden looks much the same all year round. There are a number of maple trees whose leaves turn to a stunning red and orange colour in autumn.